Finding SLS free mouthwash is relatively easy these days with demand increasing as people become more wary of Sodium Lauryl Sulfate. 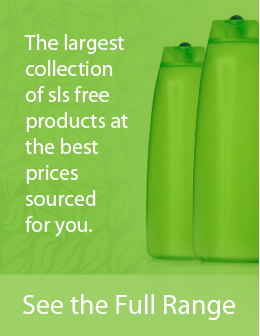 There are a number of companies now providing natural SLS free hygiene products, everything from soap to mouthwash. In this article we’ve taken a closer look at three of the most popular mouthwashes that are free from Sodium Lauryl Sulfate. Our number one choice is Thera Breath Oral Rinse. This company has been around for over 20 years and they arguably create the best natural product available. This product primarily contains natural ingredients that are used with minimal processing. These ingredients are also extracted directly from the source instead of being created synthetically. Thera Breath Oral Rinse will keep your mouth feeling healthy and fresh. It will completely destroy food odor and bad morning breath. Consumers also report that there is no alcohol burn that is common with other brands. Additionally, the taste is fresh and enjoyable. The product works by using a patented formula that has no artificial flavors or colors. It’s gluten free, vegan, and kosher certified. This is truly nature’s answer to oral care. Nature’s Answer Mouthwash was scientifically engineered to improve the health of your teeth and gums. If this is your main reason for buying a mouthwash, then this is the perfect brand for you. The main ingredients are co-q10, wildcrafted herbs, and folic acid. These ingredients all have known oral hygiene properties. There is also a subtle mint flavor that will give your mouth a fresh sensation. Your gum health will improve and your teeth will be whiter by using this product. Nature’s Answer is free of fluoride, SLS, paraben, and alcohol. There are no detergents, artificial colors, or artificial flavors. Desert Essence Organics are fairly popular in natural grocery stores, so this product should be relatively easy to find. Their products are not tested on animals, and most are suitable for vegans as well. Again, this is a good company to purchase from if you’re an animal lover. Desert Essence Tea Tree Oil Mouthwash has had very positive reviews. People enjoy the taste and report that it’s non burning and also not overpowering. Most importantly they get very good results. Tea tree oil is the primary ingredient, and it has known antibacterial, antiviral, and anti-fungal properties. This keeps your mouth healthy and fresh with regular brushing practices. It also helps reduce plaque over time. And of course, it’s completely free of SLS. What are the benefits of a natural mouthwash? Your health will improve and your mouth will feel great. Toxic chemicals can easily create health problems so we want to avoid them whenever possible. Of the three products listed, we believe that Thera Breath Oral Rinse is the best sls free mouthwash available. It is made from a responsible company thats cater to a natural and environmentally conscious lifestyle. If you’ve been looking for mouthwash without SLS, then give this product a try.